The Pennsylvania Constitution requires the General Assembly to convene on the first Tuesday every other year to swear-in newly elected and re-elected members of our body and to commence a new legislative Session. This year, the first Tuesday happened to fall on January 1. It is hopefully very telling that the 2019-20 legislative Session kicked off on New Year’s Day. Many view this day as a fresh beginning and a time to start anew. I believe that this also marks a time in which my colleagues and I begin a renewed effort to serve the people of Pennsylvania in fresh and unique ways. I look forward to working with all of my colleagues, on both sides of the aisle, to meet the needs of our constituents while continuing our efforts to make Pennsylvania a model for all other states in job creation, economic development and innovation. 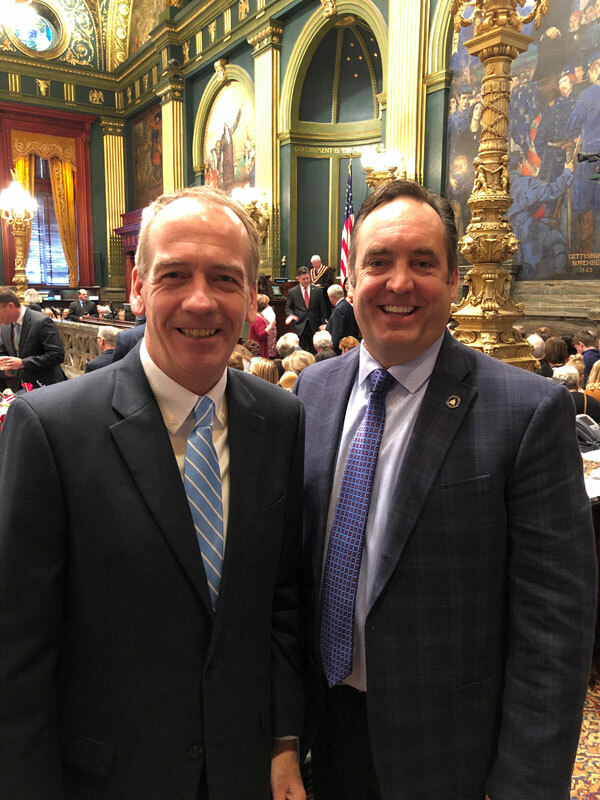 It was my pleasure to recently celebrate with my good friend, Majority Leader Jake Corman (R-34), as he took the oath of office for another 4-year term in the PA Senate. Agriculture and Rural Affairs – Senator Elder Vogel, Jr.
Communications and Technology – Senator Wayne Langerholc, Jr.
Pennsylvania will initiate issuance of REAL IDs beginning in March 2019; more than a year ahead of the October 1, 2020 deadline to board a domestic commercial flight, enter a federal building, or access an ID-required military installation, according to the Pennsylvania Department of Motor Vehicles (DMV). Bring the necessary documents to any of the DMV’s 71 Driver’s License Centers prior to March 2019 for pre-verification and simple facilitation of REAL ID licensure. Contact the Department of Vital Records for the PA Department of Health to obtain a PA birth certificate. Out-of-state birth certificates are available through the National Center for Health Statistics for the Centers for Disease Control and Prevention. Consult the list of Frequently Asked Questions for specific details on REAL ID as it passed Congress in 2005 and its implementation in Pennsylvania.